Adorable dogs! This collection of plush pooches features a variety of colors and designs. Assortments may vary. GIVE THAT DOG LOVER IN YOUR LIFE A LITTLE GIFT FROM THE HEART. 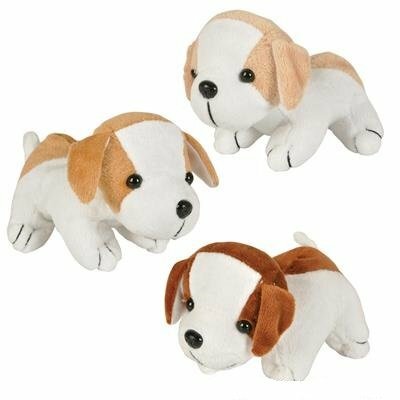 These adorable Plush Realistic Dogs make cute and cuddly companions and these plush dogs will quickly become your best friend. PERFECT FOR BIRTHDAYS AND SPECIAL EVENTS. Just the right size to drop in your gift bags. Give these little party favors away at birthday parties, office events, animal abuse awareness fundraisers and more. STUFFED ANIMALS HAVE SPECIFIC PSYCHOLOGICAL SIGNIFICANCE OFTEN USED IN THERAPEUTIC SETTINGS as a source of comfort and positive feelings. Studies have shown that touching a plush animal can lessen the adverse psychological effects of social exclusion and reduces stress. ADORED BY BOTH ADULTS AND CHILDREN ALIKE, the love for these affectionate stuffed animals, is not one that is easily outgrown, and does not stop when we leave our childhood behind. BUY WITH CONFIDENCE! Backed by Neliblu 100% money back guarantee. 100% brand new and high quality stuffed animals. If you have any questions about this product by Neliblu, contact us by completing and submitting the form below. If you are looking for a specif part number, please include it with your message.